Teaching reading is a complex task without a simple formula for developing quality instruction. The authors present a deep and thoughtful conversation about what is meant by effective reading instruction for all students. 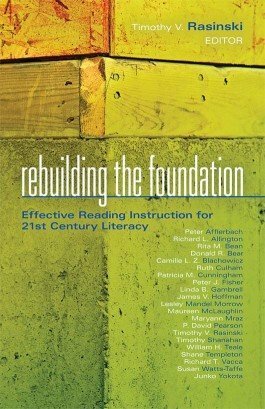 Rather than build on or alter existing models, this book considers how educators and policymakers might think about rebuilding and reconceptualizing reading education, perhaps from the ground up. Think more broadly about what constitutes effective teaching and teachers of reading. Find out what literacy-rich classrooms look like, and examine case studies of teachers using comprehensive exemplary instruction in the early grades for beginning readers. Learn about nine classroom practices that nurture and enhance students reading motivation and achievement. Attain general guidelines for choosing classroom reading materials, and outline age-specific ideas about key materials for elementary, middle, and high school classrooms. Study research about vocabulary instruction for all students, including English learners, and discover the potential role of technology. Examine the different purposes and audiences for reading assessment, the formative and summative nature of assessment, and the focus of assessment.